Experienced professionals for home cleaning Services Los Angeles will show up on time at your doorstep. Professional Home Cleaning Services should never miss a detail. Their work should be spotless and thorough. Good Home Cleaning Services will thoroughly clean all the rooms in your home using a customized cleaning plan. Professional Home Cleaning Services Los Angeles will go through your home and ensure every room is dusted from top to bottom. They will usually begin with cobwebs and hard-to-reach corners and remove the dust on the ceiling fixtures, fans and the like. 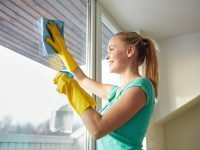 This is an efficient way to begin cleaning because when the dust falls to the floor, it can easily be gathered in one place and swept out of the home or collected with a dust pan. Delicate items should be handled with care when moving from the ceiling to the shelves, counters, furniture and other surfaces. Once the floorboards have been dusted, the maid service should begin working on specific rooms. Home Cleaning Services should ensure that each room gets a thorough cleaning. They should have a detailed checklist which should be shared with the client showing how they will ensure every part of individual rooms will be cleaned. The following are some of the areas that the Home Cleaning Services should pay keen attention to in every room. Kitchens: washing and disinfecting counter tops, wiping cupboard fronts, tables, and chairs and mopping the floor as well as emptying the trash. Bedrooms: emptying the trash, sweeping and mopping the floors, wiping bed drawers and headboards, cleaning the baseboards and mini blinds. Compared to doing it yourself, hiring a maid can save you lots of time especially if you are employed or run a business. House chores can take up a tremendous amount of time and hiring outside help makes a lot of sense to many people. Professional Home Cleaning Services Los Angeles are quite affordable. In fact, to save money, take out a long-term contract as opposed to ordering erratically. Long-term contracts always have better value for money. Many Home Cleaning Services are flexible and will customize the cleaning according to your preferences. For example, you may not want certain cleaning products used in your home or you may want extra dusting to reduce allergens. You also may not want certain rooms or items cleaned. Whatever it is that you want, most maids are willing to bend over backward to accommodate you. Whichever way you look at it, hiring a professional maid makes a lot of sense.